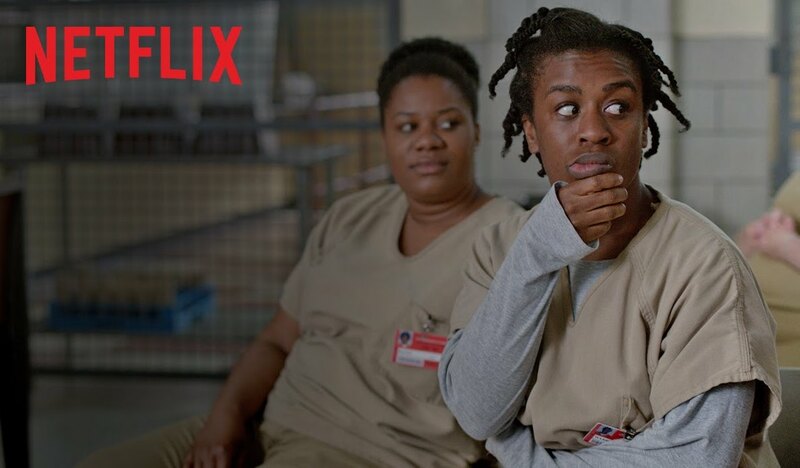 The trailer for season 3 of Orange is the New Black hit the internet today, and it’s given us plenty to mull over until the episodes go live on Netflix June 12. We last left Litchfield as management changed hands and all hell was breaking loose. After months of wondering what could possibly happen next, Netflix has finally given us a sneak peek of what’s to come. Check it out. What? Let’s watch it 10 more times and break down what we’ve learned. What an irredeemable mess she was. How refreshing to see Cindy, Taystee, and Poussey goofing off instead of fearing for their lives under Vee’s control. Sorry not sorry she seems to be gone. Pennsatucky? Oh dear. After the events of the last episode, it’s not really a surprise that Morello the Stalker was relieved of her chauffeur’s cap. We’re guessing Doggett’s dry welcome won’t involve wedding magazines and toothbrushes à la her sun-shiny predecessor. And apparently confused about how she landed herself back behind bars. Oh, Piper. This could get awkward. Why is she crying in the bathroom? And punching a newcomer right in the face? Can it be June 12 now, please? Lori Petty (who receives Alex’s aforementioned punch) joins the cast as Lolly, who seems pretty impressed by Litchfield’s clean walls upon arrival. We also get a few glimpses of Ruby Rose looking super-hot, but no further hints about what havoc she is sure to wreak. We know she’s a heroin addict whose mother had enough of her, but so far we don’t know how everyone’s favorite wisecracking inmate landed herself in Litchfield. Because who else would write erotica — forgive me, a love story — about group love between humans and aliens? She’s another lady I am thrilled to see no longer under Vee’s despicable thumb. Though his confession to Caputo fell on deaf ears, it appears Daya is ready to forgive Bennett for not stepping up sooner. But where in the world is Pornstache? Surely he’s not going to take this all sitting down. Ooooh, you guys. This might be what I’m most excited about learning. What could Sophia have done to elicit a death threat from Gloria? Boo’s haircut wasn’t that bad. Piper has been on the receiving end of more than one stern lecture in her months as an inmate, but here we see Red give her a much-needed wake-up call. No news yet on the just as much-needed slap upside the head, but we’ll keep you posted. The trailer focused fully on the women of Litchfield, leaving us wondering what Caputo and Healy are up to. Will things finally change and the nonstop drama cease now that Fig is out of the picture? Man, I hope not.